I think that the Hospital Study speaks to your concerns, which are real. My sense is that consolidating local resources -- from doctors' offices to urgent care centers into ONE hospital -- would pay the bills. Also, hospital employment alone would increase the "private pay" base. It all feeds on itself. We need to invest upfront to get the private pay population to come. Chuck are you talking about the new gym at the high school. If I am not mistaken it was voted on by all Sharp county for a one time sales tax increase with a sunset clause to build it to replace the old one which was built in the 60s. It cost around $4million I believe. It has been a good investment for the county. As to the hospital when will everyone understand it is the MONEY that CAN NOT be made here due to a limited group of citizens with commerical insurance. MEDICARE does not pay the bills. That is why the last one when under and why the Salem one does not have a bright future. There are hundreds of counties that do not have a hospital sad to say but that's life. We left the village (sadly) to be closer to medical facilities and more shopping and food outlets. As to growth for the village, I don't see that ever happening since it was designed as a retirement village and yes you are soo right about the surrounding communities about how they feel about the village. That was brought on by "out of towners" who thought they Knew what was best for the area. Which through the years has pretty well shown they should have kept their mouths shut. I moved there for less government and ended up with more that has created more problems than they solved. I wish the villagers the best and hope that one day they wake up and return the village to what it could be without a city government. Hi Paul, I have to agree with you. That is one sad trip down memory lane. It's really a shame that it has been two and a half years that has gone by since this article, without any real action seen on the hospital. I am sure the poor economy is a major player here. I am ashamed to say that I am not sure where the money came from to build the new gym/auditorium. I hope somebody can shed some light on that for me. I would surely agree that a 6 million dollar hospital is much more important that a 9 million dollar auditorium, but I am not sure on those numbers. Maybe it's not as important to folks outside of Cherokee Village. After seeing the absolute divide, during to latest annexation discussion, it became very clear that there is a problem. The attitude from local folks in the surrounding communities is very negative towards CV. They are very quick to point out that it is not directed towards the citizens, but the way government is handled here. It's also not aimed just at City Hall, as they also show disdain for the management of SID also. When I went to the P&Z meeting earlier this week, I was pleasantly surprised by the continuing desire for promoting CV, and caring for our community, by several of the citizens of CV that did attend. A trip down memory lane here. In the Area Wide News of November 11, 2009, there was a heated discussion reported concerning local tax proposals. In any case, the hospital came up which shows how long it has been on the radar among other things and how it is tied to the vitality in the area, Note also the comment about the choice of a gym over a hospital! Do you recall that sad matter? "... Tom said he had more questions than comments. He was unclear on what the city was attempting to promote besides the lakes and golf courses which are already heavily promoted through the real estate advertising. He said he felt businesses needed an incentive to move to the area and also, like many others brought up, the fact that there is no hospital in the area. Tom said, "If we are going to have a $9 million gym, then let's have a $6 million hospital." A realtor with Southern Pines also addressed the audience regarding the hospital issue saying a hospital is crucial to growth in the area. She said people are moving out every day due to health issues to be closer to a hospital. 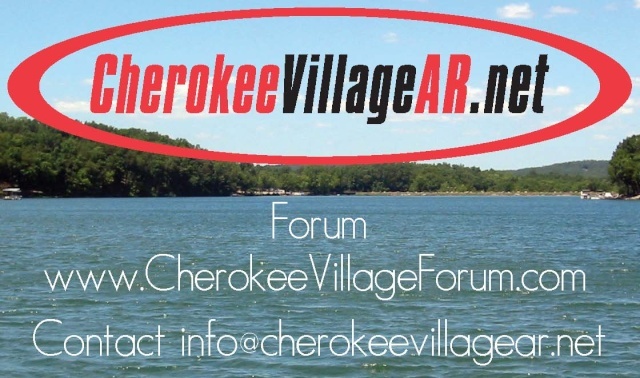 Still another audience member said that nearly one in five homes in Cherokee Village are vacant and property values continue to go down due to the lack of a health care facility in the area. Most audience members agreed the logical order is to first get a hospital before an A & P. Others felt the A & P tax would generate the growth needed to sustain a hospital in the area and should be the first step, rather than the last. Another issue that seemed to be of unanimous concern was the fact that many did not want the city to grow. Some audience members said the reason they moved to the area was for the quiet relaxed atmosatmosphere and many had no desire to see their hometown grow. ..."
Hi all, I am very glad to see there is some recent action taking place in regards to a hospital. It is an issue that is really hurting our community, and needs to be our # 1 issue. I have not been on the forum for a while now, and thought I would check to see if there was a current topic thread on CV budget/financial troubles and the talk possible annexation of land. I know that the annexation has been tabled. Movement on the hospital scenario could possibly be a great solution to some of our budget issues, given the right circumstances. Rumor has it that there may be some recent progress in this matter. Do you have and update to share? I thought some big hospital news was coming? Any recent progress? I really hope that this comes to pass -- both for employment and health of the community. There is no way to sustain a retirement community or attract business without this hospital. Thanks are extended to all who are seeing this through and had the vision in the first place. I have spoken with a few people on the committee for the new hospital. 100% agreed. The only problem is that they are likely the same players. How much will they invest and where? Being that this is a small area, I think everything affects it. However no matter what Salem does in no way should have any detrimental effect on us getting a 24/7 ER on the 4 lane. I really believe that our getting a new hospital in the near future is not something that has a high probability of happening. Once again I will say the 24/7 ER here is the biggest priority for Cherokee Village and the Quad Cities. No other issue can come close at the present time. It must be done. I really don't want to be the one, but someone needs to raise the question of whether the negotiations around Fulton Hospital and possible merger with a major local hospital will impact the hospital efforts for Sharp. Like i said, I hate to even raise the issue but it seems foolish not to be prepared to address that issue. I'm sure the Board has considered it already. Any public reaction? Nothing new since our last postings on it, as far as I know. What's the status on that 24/7 ER discussion? Any hope of getting some details. As you note, it is the details that matter. 24/7 of what we have now isn't going to cut it. And 24/7 of what we have now certainly isn't worth the proposed million dollars. I hope that we all agree on that. We need to push hard for the details. Chuck, you make sense and I like it. The realist in me says a hospital won't be here for a long time, and that is why I'm pushing for a high quality 24/7 ER. It must be state of the art and high quality, not some run down office with shag carpet still from 1978 with a room in the back that is classified as an "ER". So your idea is a sound one. Baby steps. However it is done, it is must be done soon. You really are making sense. We don't have to settle for the 24/7 ER as the end. Rather, it can be the front-end of the hospital project. We need a partner committed up-front to the bigger project of combining the 24/7 ER with the developing hospital. Right now I sense ambiguity even about the quality of the 24/7 ER itself. We need details about staff, equipment, scan and testing ability, and emergency medicine doctors. If all we get for a million bucks is the same inadequate operation staffed 24/7, forget it. This needs to be a top to bottom improvement with a commitment to unite it to the hospital plan so well prepared by the Sharp County Hospital Foundation. one-cent sales tax on the ballot to raise $1.7 million for the hospital. This was a detailed presentation. That's our gift horse. Then we have Joe Walls and Larry Brown. Mr. Brown was discouraged because people on the 2005 board of directors were not on the new Sharp County Hospital Foundation board. Why should they be. They didn't get anything done. Joe Walls comes in and says for 1 million dollars they could keep the urgent care clinic open 24/7. It seems like a lot of study went into setting that figure. That sounds more like a little blush for the pig with the lipstick. Why couldn't we talk with others, build a state of the art ER open 24/7, as the first addition to the excellent plans designed by Larry Bronson for a fully operational hospital to be built around it in the near future. It could be a jewel for Sharp County, create "good job" growth for our area, and maybe just make Fulton and White River raise their quality bar a little higher, to keep folks in their area from coming to ours. Although they would be welcome here. Then we get to enjoy a portion of that $60 - 75 Million right here in our county. That just might give Larry, Moe,( I mean Joe), and Curly that "deer in the headlights" look. A lot of people are viewing this topic. Any other folks willing to offer an opinion on what needs to happen? This may be the single most important topic we are engaged with on the Forum in terms of the longterm wellbeing of the Village. I truly have nothing against Fulton and wish them well. The issue now is who can win the quality of genuine care battle. Half baked won't cut it. If I were to advise Fulton, I would say try to win the high-tech ER war and provide surgical suites for doctors from outside. How much longer do you think FCH will be here? Agreed. A prefect example of what I mean by how much the "details" are what matters is Fulton Hospital. We got a lot of local press that Fulton was now certified as a "level 4 trauma center." It sounds great until you read the legal definition of what that means in the State of Arkansas. It basically reduces itself to the fact that they now have a certified helicopter pad for transport. Well sure that's an improvement but it is a far cry from what people are led to think by the trauma designation. What really matters is what they can do to save your life when you get there by having top emergency trained doctors and high tech life saving equipment. It is essential not to be satisfied with general terms or promises. We must know the details of what exactly will be provided. Stuff of real value to us will cost White River money. There is an incentive to cut corners and we need to watch closely what is really happening in the ER itself. Unfortunately, the quality thus far makes us rightly worried to watch the facts on the ground. Again, congratulations to local representatives who have worked hard to get us this far. Paul, you are right, but I am looking at it realistically. The chance of getting a new modern hospital built on the 4 lane cannot be done in the next year, or even 5 years. I really believe that if we were given the go ahead today on a hospital, it would not be up and fully running for 3 to 5 years, and we are probably 3 to 5 years away from even getting the go ahead. So a hospital is not happening anytime soon. What can be done is a 24 hr 7 day a week quality ER and we do not have that now. We have mediocrity right now for emergency care. Let's call a spade a spade. We have lipstick on a pig right now for emergency room care and everybody knows it. I don't care who in the medical field or elected leadership area gets offended by what I say because what we have right now is completely unacceptable for emergency room immediate life threatening urgent care. Right now it is not open 24 hours a day 7 days a week staffed by a doctor at all times who can save a life and stabilize someone to be transported by ambulance or helicopter to the correct hospital for that type of life threatening event. We don't have that. What we have is not enough and it is not enough to keep people here who are worried they might have a heart attack and if they have a heart attack, well by god, it better be while the urgent care facility is open. Ooops, you had a heart attack on Christmas morning? Sorry buddy, you'll have to wait until the start of the next business day so we can open our presents and eat turkey first.... Does that sound ridiculous to anybody? Of course it is, but it's not far from the truth. In that scenario, you would call 911 as normal, paramedics come, and transport you to Salem Hospital 25 to 30 miles away. That is not good enough. What we have right now is mediocre at best because it is not 24 hr 7 day a week full ER constantly staffed by an ER trained doctor and that is the most urgent problem that must be fixed. I have spoken with people at the Urgent Care Facility and believe me, they are just as interested in getting a 24 hr 7 days a week ER as just as anybody else is. They have what they have but it is not 24/7. I will accept baby steps in getting this done but I will not accept what we have now. I don't disagree about the doable nature of settling for this proposal for now. There are two things that need to be kept in mind. The second is the most important and tbe one I guarantee we well get fuzzy noncommittal responses to. 1. We have to understand that a 24/7 ER will do little to nothing to create jobs in the area. The hospital feasibility study was clear about the jobs that wiil come from a sizable institution and how a full range of medical services will keep our older residents from having to move. 2. Quality and scope of care. We need a high-tech ER. The important stuff is in the details of what White River -- a for profit operation-- will actually provide. The quality of that ER thus far has not been overwhelming. I am grateful to our local representatives getting us this far. It is a major accomplishment reflecting much hard work. While everyone agrees there is a need for a hospital, others supported a second option, which seemed to be the favored choice among the mayors present. White River Health Systems proposed to staff the current Urgent Care facility, creating a 24 hour emergency room. Joe Walls, administrator of the clinic, said for $1 million, White River would staff the current facility that is already in place and insure the cost stays the same. The county would have a contract with White River for their services. The plan is to start small and expand the emergency facility with additional beds, as it becomes economically feasible. In order to finance the $1 million, the group needs a one-cent Quad Cities sales tax, rather than one covering the entire county. This proposal makes some sense and it is what I have been pounding the table on for awhile. The hospital idea is a nice idea and one that I fully support, but I also realize and have been saying it for awhile now that it is something that is still many years out. The real doable idea that will work is a fully staffed 24 hour 7 days a week ER on the 4 lane. This MUST be done and done NOW. Let's get this done. Without it, I fear for the long term outlook for the area. I am not kidding. There are countless little towns all over the United States that have died or have slowly withered away after losing some vitally important part of the area. In our case, it is the lack of quality, respected, modern and up to date 24 hour emergency medical care. Right now it is a joke, but this is no laughing matter, folks. If we do not get this and get this soon, we WILL be on the same slow downward track that thousands of communities have suffered through before us. The draw of Lake Thunderbird cannot save Cherokee Village from a downward spiral without nearby quality 24 hour a day emergency medical care. It is not enough. Again, I am not kidding. I hope I wasn't too unclear with my position on this. Paul, great point. I completely agree. To anybody and everybody who will listen.... Read the report. Get informed!